Did I miss his first three terms? Maybe James forgot the GOP circa Watergate. Bad scene. I wasn't alive during World War II. But my mother told me that Roosevelt died during his last term in office. And they had a very big funeral. I believe she was telling me the truth. So I couldn't tell you which term that was because I also he hear that he had more than two terms. But if you were alive then, maybe you can have the data on which term it was that he died in. But whichever term it was - - he didn't live the entire four years of his last term and our man " the buck stops here" from Independence had to take over. Reese's Peanuts has been named Chief of Staff, while Steve Bannon has been named "senior counselor & chief strategist". 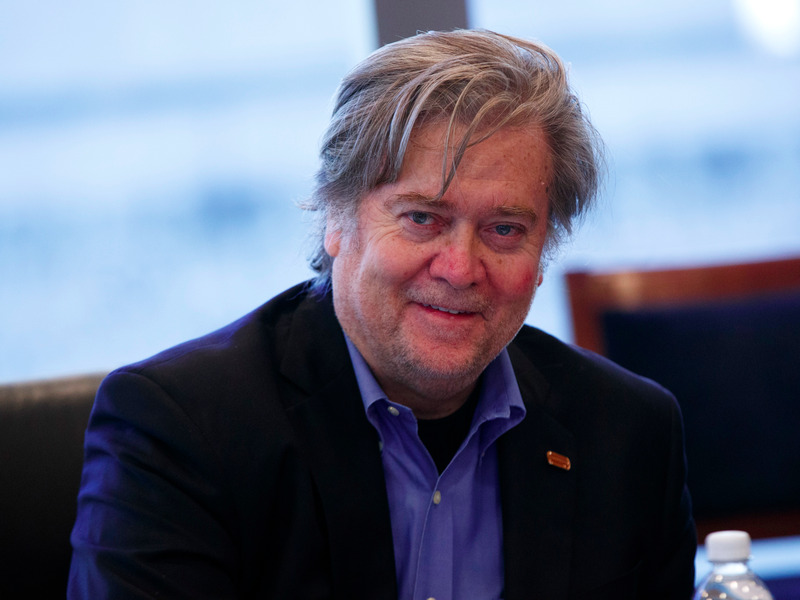 Anti-semitic white nationalist Steve Bannon will have an office in the White House. The Alt Right white supremacist has arrived. By the way, when is the Klan's victory parade taking place? You can check the Alt Right thread for details. 30% of transition funds were being spent on pizza and hot wings. Bannon's not all bad. He looks like he has rear end potential. "when I’m president I’m going to allow Mike Pence to run foreign policy and domestic policy. I don’t want to be involved in these details, I’m not going to be involved in policy making. And then they said to him I think it was at a New York Times editorial board interview, well if Mike Pence is going to be running foreign policy and domestic policy, what are you going to be doing? But look at the people that he is going to be empowering. And by and large they are the traditional, hard, hawkish right wing members of the Republican Party because the more moderate people, as at least that term is understood in Republican politics, were the ones who were essentially radically against him. FDR died very early into his fourth term. His health was very poor during the "campaign" in 1944. I haven't seen a full body shot of him, only his face. Especially considering that he's the oldest man to ever take office at 70 years of age. Speculation of him being impeached is silly. The Republicans in the House KNOW that if they offend Trump's people, they will be out of a job. They will be primaried by someone much farther to the right who supports Trump. Also, they believe they can influence him or at least get their initiatives passed and signed. There is a possibility that they could harrass and frustrate him enough that he will say to heck with it and resign. And 70 is the new 40. They said it would be easier to monitor Trump's conflict of interest business deals if he would release his taxes. Now that he has no political opponent in an election he could release them. Not going to happen re: his taxes. Also, not sure, but there may not be any "conflict of interests" regulations for the president. There are none in Constitution and Congress cannot pass laws to regulate the president. There are provisions in Constitution prohibiting rewards, gains, etc. from foreign powers. I had heard the rumored possibility, but it just sounded too ridiculous to be serious. Perhaps that's the new normal, though. Trump is leaning toward John Bolton as Secretary of State. That's right, one of the biggest jerks in GWB's administration, Bolton was the constantly sour-looking blowhard that notoriously verbally attacked and belittled his staffers and most anyone else around him. He was named our representative to the UN, which makes sense in Right-Wing Land, since Bolton had made a name for himself calling for the disbanding of the UN. By all reports he did little to strengthen America's ties around the world back then, and even worsened some. So naturally Trump wants to make him our Chief Diplomat. 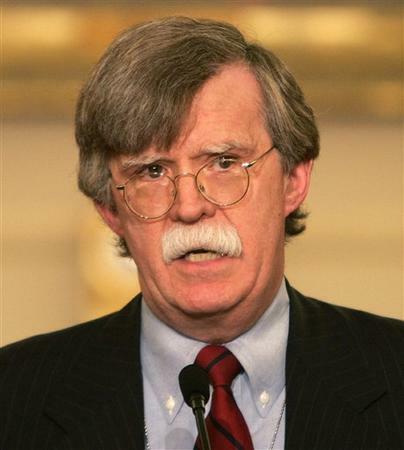 John Bolton, a man so frightening that he scared his own mustache white. Bolton is a moron as well as a war-m-o-n-g-e-r. Poor choice for SOS. One problem Trump has is that he does not have a good selection of candidates for any position. His campaign was made up of 2nd and 3rd stringers in politics and his surrogates and staffers. He has to reward them and he has to select people his "team" will approve of. Very few good choices. Besides what really qualified person would want to serve in an administration knowing that Trump is going to defer to certain people in all matters and those people will override the cabinet members and agency heads. I just read another article about the behind-the-scenes in-fighting going on in Trump's camp already. One side, led by Rinsed Peanut, wants all establishment Republican choices for cabinet jobs. The other faction, led by Steve Bannon, wants more radical hard-right choices. Bolton is no longer a done deal as Sec of State. Now Guiliani is being floated for that post, as they want AG to go to Jeff Sessions. I also heard on the radio today that Florida AG Pam Bondi, she of the "bribes for dropping the TrumpU lawsuit", has been made part of the transition team, and will likely have a cabinet position. Florida governor Rick "Voldemort" Scott is also being talked up for a position, and as the former head of a hospital conglomerate responsible for the largest Medicare fraud in US history, he'll fit right in. Others think he may just wait and try to unseat longtime Florida Democrat Bill Nelson from his senate seat in 2018. An anonymous source inside the transition talks describes them as a "knife fight" and "buffoonery". Bad idea, find someone else, his views are clearly documented. Gingrich had to make an outrageous comment in that Bannon cannot be Anti Semite because he worked in the finance and Hollywood industry. That has to be the dumbest thing I've ever heard. Damn, he looks like Micheal Moore's drinking buddy. This is a very entertaining and eye-opening Washington Post story. It should certainly make one think twice about ever voting for a rank amateur again. And as it begins to take shape, Trump’s administration is looking like some kind of mash-up of “Being There” and “American History X,” with just the combination of cluelessness and malice that you would have expected. During their private White House meeting on Thursday, [President] Obama walked his successor through the duties of running the country, and Mr. Trump seemed surprised by the scope, said people familiar with the meeting. Trump aides were described by those people as unaware that the entire presidential staff working in the West Wing had to be replaced at the end of Mr. Obama’s term. The man ran for president for a year and a half, and is surprised that the presidency is such a big job. Meanwhile, his aides were under the impression that the Obama staffers would stick around and be working for them now. This is appalling, but it shouldn’t be surprising. Those of us who actually contemplated a Trump presidency during the campaign were particularly disturbed not just by Trump’s ignorance, but also by the fact that it was accompanied by a certainty that he knew everything he needed to know, despite the fact that he knew virtually nothing. For those who wish to take comfort in the idea that the Donald will surround himself with good people to run the government it might be worth remembering that he staffed his Trump University with salesmen who had false credentials and no or little experience.